I have posted the new dates for courses https://anniemulholland.com/courses/ that start this September. Feel free to call any time to enquire about the courses, if you don’t see a date that suits your schedule, just call and I will see what I can do. I give courses for Art centres and the W.I. (Women’s Institute) of Wiltshire so just ask about these day courses too. Enthuse your creativity and make a beautiful, colourful and lively stained glass. I have finished a restoration commission in Bridgwater which is now installed. I am completing the new stained glass window commission in Beaminster, Dorset of the ‘The Boxing Hares’. Making this new window has been a delight in the traditional stained glass painting techniques using oxides, enamels, silver and amber stains. 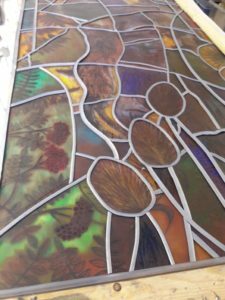 I have nearly completed this window and it will hopeful be installed in September. I have a new commission locally in Bradford on Avon of four panels using traditional painting on glass with the theme of ‘The Seasons’. I am designing and have been inspired by trips to Avebury and Dorset, walking in nature’s beauty. I am taking part and putting up an exhibiton in my studio for the Peacock Art’s trail, which you can find out about it and see a map of where the artist’s are based https://peacockartstrail.co.uk/exhibitors2017/ there are over 70 artists taking part! I shall be showing and selling stained glass panels, glass feathers, glass angels, glass pendants and cards. You can book on a course to make a beautiful panel or a small lampshade. I shall be offering light refreshments and there is plenty of parking! The barn is a hive of creativity at 2A Woolley grange farm, the swallows have now flown on their long voyage to Africa until next year. The sun shines lower and warmly into the studio as I draw and paint my designs for the next stained glass panels.